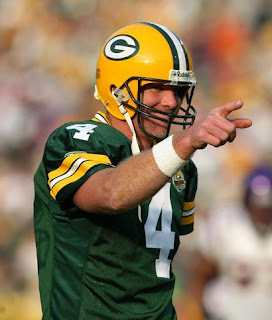 Badgerland Sports Fan: Favre Comeback??? It is hard not to hear about this story. Turn on ESPN and it's there; turn on the local news, and yup, it's there too! Right now there are so many rumors I don't know if it pays to think too much about it until there is something solid. Supposedly Favre sent a text message to Ted Thompson that he wants to come back but Thompson is on vacation and won't answer right now. Local reports claim that is not something Thompson would do. There is a lot of talk about what will happen if the Packers don't take him back, could he be wearing a Vikings jersey come fall? There is also a lot of discussion about the options for the Packers. You have to think that the only reason they wouldn't take him back is if he won't give them the best shot to go to the super bowl. And if you don't think he will come back and be really good you wouldn't be worried if he went to another team. I guess we will have to wait and see what pans out on this one. It is definitely the news story right now!